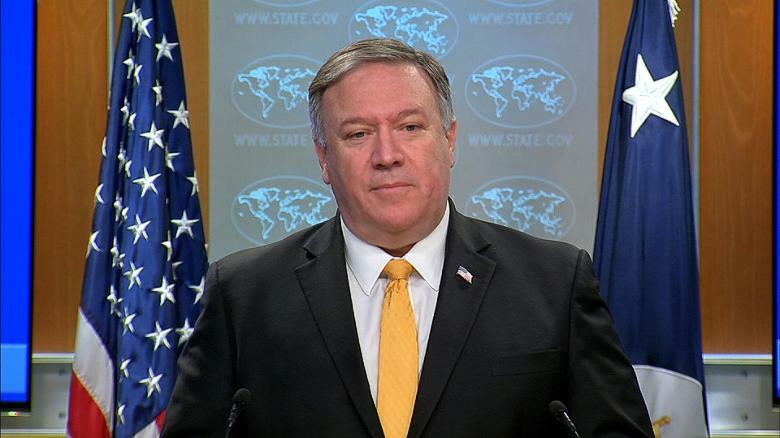 Washington (CNN)Secretary of State Mike Pompeo announced Friday that the US is suspending the Intermediate-Range Nuclear Forces Treaty, a key pact with Russia that has been a centerpiece of European security since the Cold War. Later, at the White House, the President hinted to reporters that he'd be open to negotiations on a new treaty but did not mention Russia by name -- the only other signatory to the pact. "So unless we're going to have something we all agree to we can't be put at the disadvantage of going by a treaty, limiting what we do, when somebody else doesn't go by that treaty," Trump said. While Russia and the US are the only two parties to the treaty, but it significantly affects European security. "We are heading into a direction we have not been in in 40 years: no arms control limits or rules that we are both following, and that is very dangerous," said Lynn Rusten, a senior director for arms control and nonproliferation at the National Security Council during the Obama administration who is now a vice president at the Nuclear Threat Initiative. US officials and lawmakers have expressed concern that the treaty is allowing China to gain a military advantage, as Beijing is not bound by the INF treaty's limits on intermediate range missiles that currently constrain the US. Trump appeared to confirm this in his Friday remarks to reporters, saying, "first of all you have to add countries" to the treaty. But a senior US administration official denied Beijing is a factor. "There's a lot of discussion about China," this official said, briefing reporters on the suspension. "It is a reality that China is unconstrained, it is a reality they have more than 1,000 of these weapons, but for the United States this has nothing to do with China. This is solely about Russia's violation of this treaty." "We simply cannot tolerate this kind of abuse of arms control," the official said. Russia has consistently denied being in violation of the treaty, and on Thursday, Deputy Foreign Minister Sergey Ryabkov said talks with the US hadn't yielded progress. "Unfortunately, there is no progress. The US position remains rather tough and ultimatum-like," Ryabkov said, according to Russian state media outlet TASS. Senior US administration officials countered Thursday by laying out Russia's repeated efforts to get the US to agree to dissolve the treaty and years of American effort to get Russia to comply, including 35 diplomatic engagements ranging from the highest political levels to technical talks. "We have, unfortunately, very little to show for it," said a US official who briefed reporters on condition of anonymity, stressing that "the onus is on Russia." "Russia continues to deny its violations ... Russia will have this chance. If they are truly interested in preserving this treaty, this is their final chance," the official continued. "It would be in Russia's best interests to return to full and verifiable compliance." This official noted the "remarkable unity" among the US and its European allies, but European officials say they're concerned about the treaty dissolving and say they will use the six-month window to urge Russia to comply. "It is clear to us that Russia has violated this treaty and that's why we need to speak to Russia,'' German Chancellor Angela Merkel said at a press conference in Berlin on Friday, shortly before the US announced its intention to suspend the treaty. Germany will ''do everything we can'' to use the six-month deadline after the termination to hold further talks with Russia, Merkel said. "Russia will feel more legitimized to continue what it's doing now, but also increasing some of its efforts on missile technology and deploying them," said a European official. A second European official said that "they will threaten, they will try to divide NATO, they'll do anything but stay quiet." The Russians will likely argue that "this is about the US and the US trying to destabilize the international order," this official said, stressing that Europe has been united in its stance, alongside the US, that Russia has been violating the treaty. "The bigger picture is what kind of sign you're sending out, what message you're sending," said a third European official. "For us, this treaty was extremely important for our security. What are we looking at instead" if it is scrapped, the official asked. CNN's Kylie Atwood and Veronica Stracqualursi in Washington, and Nadine Schmidt in Berlin contributed to this report.